Browse the internet and you will see articles about the death of advertising agencies, marketing and others… In the fast-paced digital society, digital marketers have found themselves surrounded by numerous challenges, and everything is getting worse and worse. What’s the way out in this situation? Firstly, let’s define the problems. Customers in the digital era don’t trust advertising anymore, they are tired of being interrupted and, as a result, most of them are blocking ads. Mapping out the future requires a good look at the present, so Alberto Brea, Executive Director of Strategy & Planning at Ogilvy New York, analysed the four marketing trends which aim to solve this crisis: performance marketing, influencers, entertainment and platforms. 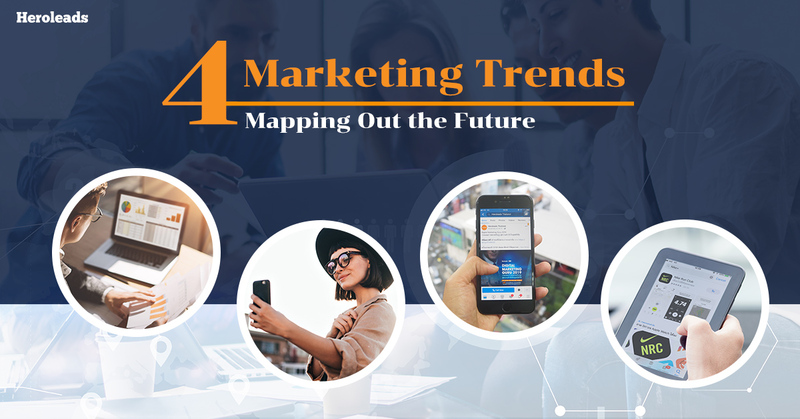 He also forecasted that one of these trends will dominate the marketing world in the near future. Let’s check them out! It’s all about delivering more targeted, relevant and faster ads to prospects. Thanks to the advanced technology of today, we can target anyone on the earth with tailored ads on any social network platform… we call it personalisation technique. Personalisation solves the problem of adverts interrupting people by launching the right message at the right time through the right channel, to make an effective communication. However, this method doesn’t solve the credibility problem because customers don’t know you and they won’t trust you. Plus, if every marketer is taking advantage of this technique, the users will still be bombarded with annoying ads. The use of influencers is a recent marketing trend and has now become its own category. The assumption is that customers trust people more than advertisers, so brands catch their attention by launching messages through opinion leaders who are part of their trusted network. Here, the credibility problem will be solved, but the one of interruption might not be. That’s because brands hire influencers to develop disruptive advertorial content on their channel so interrupting their followers is unavoidable. Plus, in the long run, Influencers and brands are at risk of losing credibility if they launch too many ads. Customers have become even more selective and move to ad-free platforms, so brands need to engage them via powerful long-form content… what kind of long-form content is better than entertainment? Entertainment solves both the interruption and credibility problems. Customers immerse themselves in their chosen content and are not interrupted to watch it, while long-form content gives brands a chance to sell their products and service. The best products that every customer needs are the ones which make their life easier and better. So, the majority of marketers agree that owning a platform is the best way to deliver great experience and engage valued customers. Buying a pair of shoes from Nike means you’re buying something that makes you healthy, inspires and helps you improve your performance. That’s why they created Nike+ Running App to improve people’s quality of life. To conclude, customer behaviour has changed so marketers need to catch it. Heroleads never stop improving human resources and innovation to improve the quality of life. We do not position ourselves as a media buyer, but an innovator who creates platforms to deliver one-stop solutions to clients. Start today and allow Heroleads digital experts to bring your businesses to another level.